Lotus at the Humble Administrator’s Garden. There is nothing humble about this garden. Stretching almost the entire length of Dong Bei Jie from Lin Dun Lu on the west to Pingjiang Lu on the east, it is far larger than any other of Suzhou’s classical gardens. In the mid-19th century it served as the backyard of the Taiping Prince, whose mansion you walk through when you exit the Suzhou Museum. The “humble” in its name was apparently an effort to deflect possible divine displeasure at the owner’s ostentatious display of wealth and power. 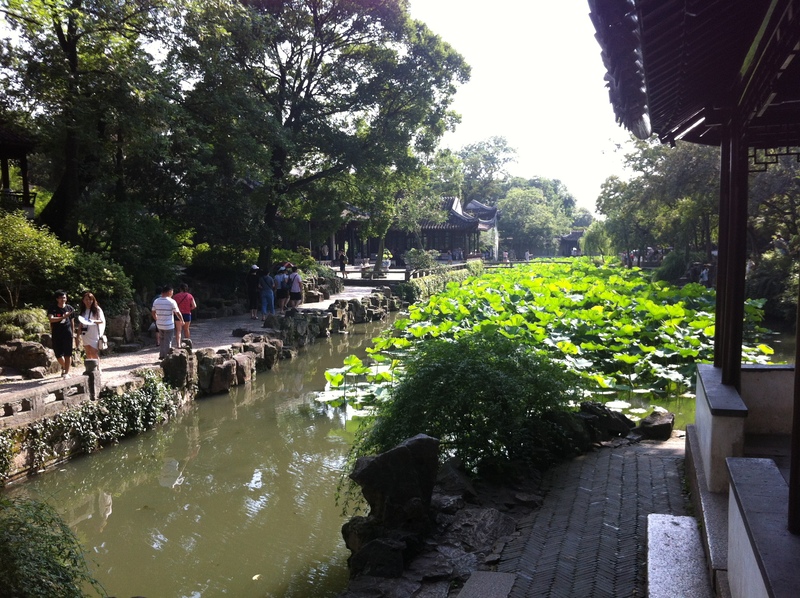 The Humble Administrator’s Garden appears in every guidebook and on every list of “must-see” attractions in Suzhou. I will not attempt here to duplicate the descriptions of it that can be found elsewhere. I will pass lightly over the obvious features of the garden, such as the magnificent series of lotus ponds. Instead I will point out the bits that I particularly like, and that you might overlook. After that, you can wander as you like and see what else you can discover. Before entering, it will be useful to get your bearings. The walking street in front of the garden, Dongbei Jie, runs east-west, and as you face the garden entrance you are looking north. Once you pass through the entrance, bear left into the small hall where you can view a large map of the garden. The path we will follow is basically a counter-clockwise tour starting at the southeastern corner. Continuing on, bear right, keeping the large lotus pond on your left. You will pass a small pavilion with a well at its center. Turning left (west), keep the lotus pond on your left. Find the House of Sweet-Smelling Rice, now in use as an art gallery, ahead on your right. Look underneath the large rectangular windows that line the south wall of the hall, and you will see a series of small bas-relief carvings in wood. Amid the grandeur of the lotus pond and the buildings and grounds, one could easily overlook these miniature treasures. Take time to pause, admire the pond, and try to work out the story being told in the carvings. Follow the path westward and pass through the doorway in the north-south wall. Pause to admire the second large lotus pond. In the distance, due west, you will see Suzhou’s North Pagoda, perched like a chess piece at the northern end of Ren Min Lu. Turn right, taking a moment to admire the framed calligraphy on the wall. A few more steps bring you to a small pavilion with four round doors facing south, east, north, and west, with a stone table at its center. Each door offers a different view, featuring plants that bloom in each of the four seasons. Turn to look through the east door and you will be puzzled: the view is blocked by the wall. But crouch down a bit, as if you were seated at the table, and the roof tiles topping the wall come into view. In winter, the snow collects on the roof tiles and icicles form during warm days and cold nights. See if you can guess which views represent the other three seasons. Finally, if you have a Chinese scholar with you, notice the calligraphy framing the east door of the pavilion. The two phrases running vertically at left and right form a couplet, and I am told this one is particularly beautiful. Cross the small zig-zag bridge, keeping the lotus pond on your left, and notice the four pavilions on either side of the pond, each pavilion with a different style of roof. The large square pavilion across the pond is the Distant Fragrance Hall, and behind it is the entrance to the garden, now locked, that was formerly used by friends and family members. We will have a closer look at it in a moment. Continuing westward you reach an intersection of three paths. Take the path leading south (to the left), and make your way toward the Distant Fragrance Hall. You may have noticed by now that the pavilions are typically surrounded by a small parapet topped with a railing (usually wooden) that curves outward. This railing, called a 美人靠 (mei ren kao, roughly translated as “leaning beauty”), gave the beautiful, bored young ladies of the household the opportunity to sit outside the pavilion, gazing at the view and thinking sad thoughts. The parapet offers very little space; you must sit sideways, place an elbow on the railing, and then rest your cheek in your hand. Try it for just a few minutes and you may begin feeling bored and sad, too. The main door of the Distant Fragrance Hall faces the lotus pond. On either side of it, in black characters on a white background, you will see another couplet. This one is notable for being the longest couplet in the garden, with 26 characters on each side. Behind the hall, to the south, is the door that friends and family members used to enter the garden. Just inside the door is a large rock formation, strategically placed to block the view of strangers looking in from outside. You will see similar structures—often walls or screens—serving the same function in all of Suzhou’s classical gardens. Continue north now toward the covered bridge—the only covered bridge in any of Suzhou’s gardens. If you pause midway and look to your left, you will see a small square pavilion. This is where servants waited while their masters visited the garden. Across the bridge, turn right along the water’s edge. Can you find the crane mosaic in the paving stones? A few steps more bring you to a rectangular stone table near the water’s edge. This is for a 古琴 (gu qin), the seven-string sister of the 古筝 (gu zheng). The ladies of the house would sit here at the edge of the lotus pond and play music. Behind the gu qin table is a rectangular hall. Take a moment to notice the bamboo stalks holding up the roof corners and the two lions at either side of the eave-ends. Over the doorway is some calligraphy written by the garden’s designer, Wen Zhengming (1470–1559), one of Suzhou’s most notable artists. The name of this hall offers an instructive example of the poetry and word-play one finds so often in traditional Chinese culture. The hall is shaped like a boat. (You must cross to the other side of the water and squint to see this.) The first character in the hall’s name, 香 (xiang) means “fragrant” and refers to the fragrance of the lotus flowers. For the second character the obvious choice, 舟 (zhou1, “boat”) was felt to be too ordinary and direct. Instead they chose 洲 (zhou1, “continent” or “island”) as more poetic but still accurate, as the pun (both characters have the same sound) suggests the other meaning, “boat”. Walk through the hall and turn right. At the western end of the lotus pond a round door leads into the next section of the garden. You will probably have to pause here while people have their photos taken in the doorway, with the framed view behind them. (The views are quite nice in both directions, east and west.) Instead of passing through the round door, continue straight ahead to the north, and turn left up the rock steps to an elevated section of the wall. From here you can see the small canal that borders the northern edge of the garden, and the pathway beyond. Turn left, along the canal. You will emerge at the edge of a small pond, with a corridor going off to your left and a small pavilion, the Reflecting Hall, up ahead to the right. Turn right, to the north, and go through the doorway. Before you will be a round trellis surrounded by light-colored paving stones. If your feet are tired, invigorate them with this free outdoor foot massage: take off your shoes, walk in a circle underneath the trellis, and sigh with relief (or grimace in pain) as the stones massage your pressure points and fortify you for the journey ahead. If you are still able to walk, retrace your steps through the doorway and turn right until you are in front of the Reflecting Hall, so named because the pond it overlooks has no lotus and reflects the surrounding scenery. At the back of the hall is a carved copy of a famous bamboo painting by Wen Zhengming, the garden’s designer. Leaving the Reflecting Hall, walk south along the edge of the pond. From here you can see why the corridor on the other side is called the “wave corridor,” as it resembles a wave in its undulations. Up ahead you will see a small fan-shaped pavilion. Examine the furnishings, and see how many fan shapes you can find. There are two seats in the pavilion, which is called “Who [Do] I Sit With?” The answer, taken from a poem by 苏轼 (Su Shi), is “I sit with the clean breeze and the bright moon.” Su Shi (1037-1101), better known as Su Dongpo, was perhaps the preeminent artist and intellectual of the Song Dynasty. There are lots of stories about him—just ask any Chinese person you know. Among other things, he supposedly invented Dongpo pork (東坡肉) by accident when he became involved in a game of chess while cooking dinner and forgot all about the food. You can order some in almost any restaurant and taste the results. (If you don’t like it, don’t blame Su Dongpo: he was actually a vegetarian.) Across the pond from the pavilion is a doorway, and in the water is a miniature stone pagoda, an imitation of the similar but much larger stone pagodas in Hangzhou’s West Lake. The pagoda is believed to protect against flooding. By now at least two or three tour groups have gathered in the doorway opposite to take pictures of you in the Who I Sit With pavilion and you are feeling a tad self-conscious—continue on to the west. Just above and behind Who I Sit With is the “Hat Pavilion, and a few steps more will bring you to the highest point in the western section of the garden, should you care to climb up to it. Finally, at the end of the path is a special section for 盆景 (pen2 jing3), better known in English by its Japanese name, bonsai. Once you have satisfied your lust for bonsai, turn south. Just past a small pavilion to the left of the path, turn left and cross the bridge with the iron railing and a trellis overhead. Turn left into the hall with blue glass panes in the windows. This two-sided hall’s southern half is called the Hall of 18 Camellias, while its northern half is called the Hall of 36 Pairs of Mandarin Ducks. We can now reveal the secret of the numbers attached to these garden structures: they are always multiples of nine, because the word for “nine,” 九 (jiu3), sounds like the word for “long,” as in “long-lasting”: 久 (jiu3). (Now: do you remember how many latticed windows there were in the walls way back at the beginning?) If you exit the Hall of 36 Pairs of Mandarin Ducks through the eastern door and then turn left, you will see in the water underneath the hall . . . real ducks! If you were hoping for 36 pairs, however, you will be disappointed. From here you can make your way back toward one of the exits by walking east. If you find the garden’s museum, you can exit through it. Just before reaching the street, you will see a tree that was planted by Wen Zhengming himself. If you leave by a different exit and want to see Wen Zhengming’s tree, walk west along Dongbei Jie until you see the canal boat dock on the left, and just after that the intersection with Yuan Lin Lu. The garden museum door, and Wen Zhengming’s tree, are right across the street from the canal boat dock. It would be difficult to visit the Humble Administrator’s Garden in less than half a day, but if you are in full tourist mode and begin early in the morning, then taking the canal boat tour afterward will give you a chance to sit for about 40 minutes. You can also walk for about five minutes down Yuan Lin Lu (going south) to 狮子林 (Shi1 Zi3 Lin2), the Lion’s Grove, another of Suzhou’s classical gardens which is, thankfully, much much smaller than the decidedly un-humble Humble Administrator’s Garden. Also nearby is the upper end of Pingjiang Lu, where you can find all manner of shopping and eating options. To reach Pingjiang Lu, turn east on Dongbei Jie (left, on exiting the garden). After you leave the pedestrian area, the first street leading to the right goes into the tour bus parking lot. The next street leading to the right is Pingjiang Lu. Many thanks to Jessica Li 李洁青, whose help with this article was indispensable. Enter on 东北街 Dongbei Jie, the pedestrian street that runs from Lindun Lu and the Suzhou Museum at the west end to Pingjiang Lu at the east. The ticket booth is at the east end, just where traffic is blocked off to vehicles. By subway, take Line 1 to Lindun Lu, then take a bus or bicycle taxi north on Lindun Lu to the Suzhou Museum; from there it’s an easy walk to the other end of Dongbei Jie. "My Suzhou" by Eric T. MacKnight is licensed under a Creative Commons Attribution-NonCommercial 4.0 International License. Based on a work at http://www.EricMacKnight.com/mysuzhou.